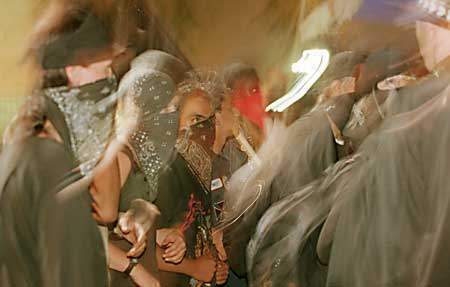 The 'black bloc' anarchists march to the Twin Towers Correctional Facility in downtown Los Angeles, CA on Thursday, Aug. 17, 2000. Copyright 2000 Dang Ngo. Free for use by nonprofit, anti-corporate globalization organizations and for personal use. All other rights reserved.